2005 cassini captures an astonishing sight, a hundred geysers shooting ice particles miles into space from cracks in the south pole. 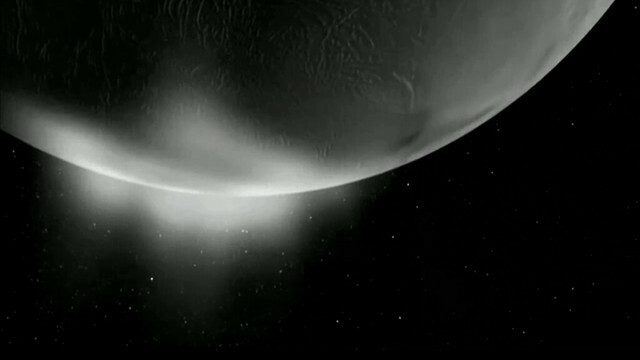 Enceladus is hurdling its guts into space at a colossal rate. As enceladus orbits saturn, these icy plumes feed a vast shimmering halo around the planet the mysterious e ring. 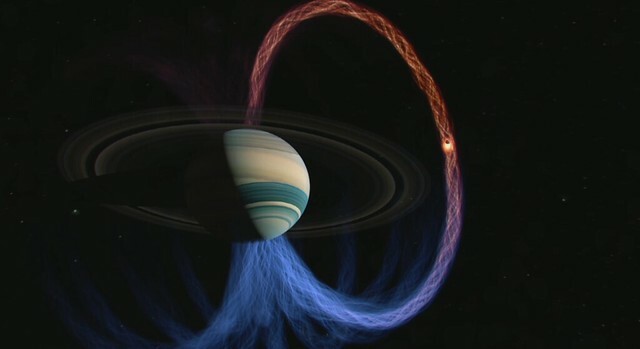 This icy plume also interacts with saturn’s magnetic field, causing a plasma cloud of charged particles, the particles race along saturn’s magnetic field lines and slam into saturn’s polar atmosphere raising huge ultraviolet auroras. Geysers explain the e ring, but how can they exist on a frozen moon a billion miles from the sun? On earth, geysers form in highly volcanic places where water comes into contact with hot rocks. Enceladus, so small, and so far from the sun, should be cold and dead, but thanks to saturn’s gravity, it’s not. 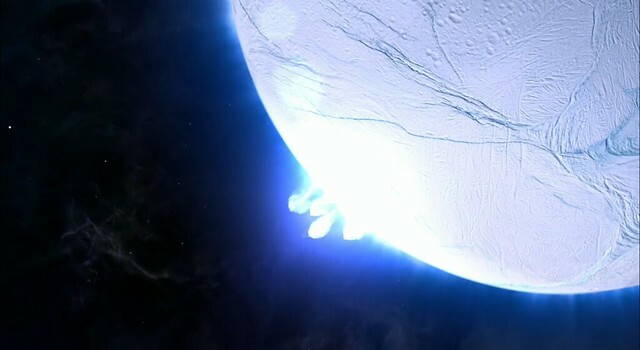 The source of the heating on enceladus is the eccentric orbit of that moon. Sometimes it’s a little closer to saturn, sometimes it’s a little further away and that heating on enceladus from that kneading gravitationally making the moon stretch and pull, is what warms the interior, causing the activity on enceladus that we see today. 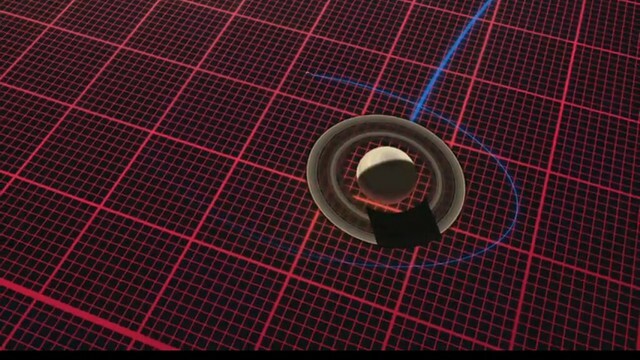 The gravitational pull of saturn reaches deep into enceladus beyond its water-Ice exterior gripping its rocky core. 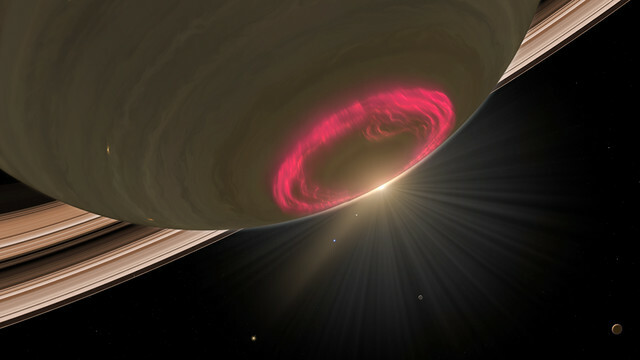 As saturn’s grasp strengthens and weakens, it massages this cold, rocky heart, bringing it to geological life with frictional heat. The heat melts the ice around it, creating a vast subsurface lake at the southern pole of enceladus. This water jets out through huge cracks in the surface ice. On earth, where there’s liquid water, there’s life. Could enceladus have what it takes for simple organisms to exist? Once cassini saw these geysers, the scientists knew hey had found something extremely wonderful. 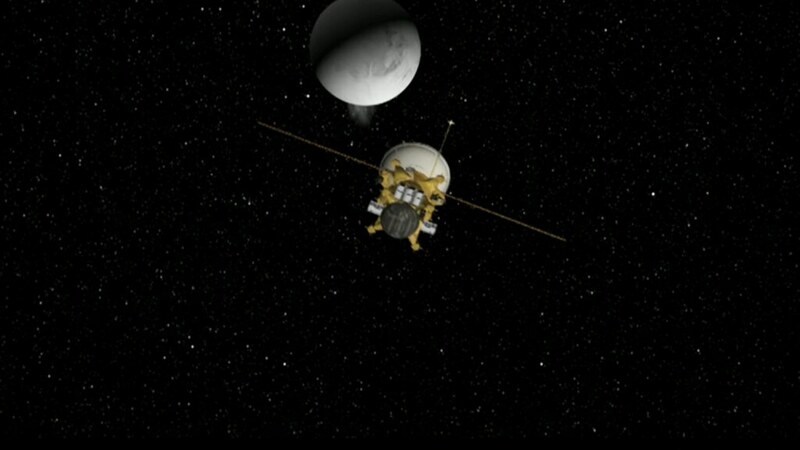 They actually changed the mission of cassini itself, changed its trajectory. They sent the cassini spacecraft to fly very, very close over these cracks where the water was rushing out. Scientists clung to the faint hope that the water would contain salts and organic molecules like ammonia, the building blocks of life here on earth. 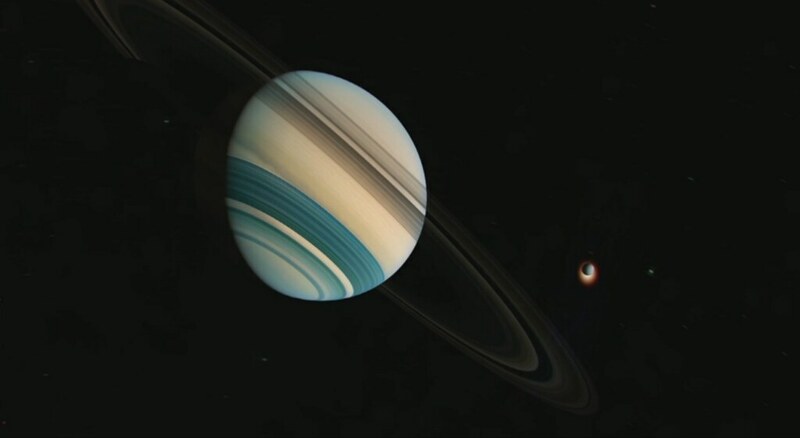 Stunningly, cassini’s censors tasted all of them in abundance. for habitability, energy source, liquid water, source of biological nitrogen and ammonia, organic material, and the samples are coming up into space. There’s a big sign free samples, take one. 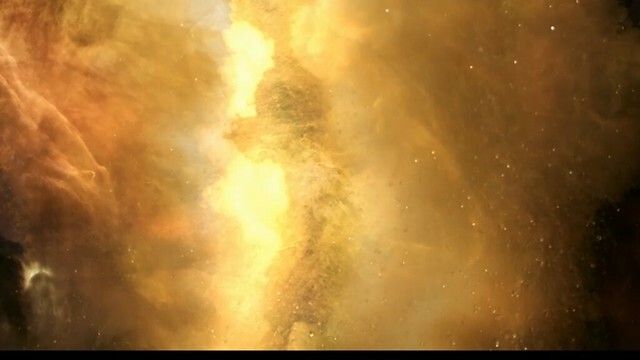 There could be life that could’ve evolved there. Now we don’t know. We haven’t seen it. But the conditions there are as good there now as they were on earth 3 billion years ago when life arose here. The sensational realization that enceladus may harbor life has sparked intense debate about future missions to find it, because it has a rival for those precious research dollars.